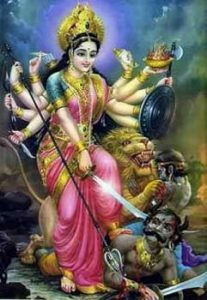 Durga Devi is the Goddess of Energy. She is believed to be the embodiment of the universe. Upon her manifestation, her body was generated by the energy of all Deities. In her initial formation she had 18 arms each wielding a weapon provided by male Deities. The 18 arms represented the 18 directions. Her more common appearance has her with eight arms. She rides a Simha (lion)/Sheru (tiger). She is considered to be the consort of Shiva Bhagvan, and mother of Ganesh Bhagvan.